(17513, Oklahoma Historical Society Photograph Collection, OHS). (20757.15, Oklahoma Historical Society Photograph Collection, OHS). Pressed, blown, and flat glass have been produced in Oklahoma over the hundred years from 1904 to 2004. The glass industry exemplifies a manufacturing opportunity that developed in the early twentieth century because raw materials were locally available. High-quality glass sand, with few impurities and high silica content, occurred in abundance in southeastern Oklahoma in the Arbuckle Mountains near Roff, Sulphur, and Mill Creek and in the northeast near Tahlequah, as well as in other locations. In addition, natural gas, discovered after 1900, provided an abundant fuel source. These criteria, coupled with a ready supply of labor, made the glass industry a small-manufacturing success story. The earliest glass products were made in 1904–10 by Great Western Glass Company of Bartlesville. Glass sand was imported from other states until a commercial glass-sand mine opened near Roff in 1913. Afterward, glass deposits were discovered in other places, and glass plants proliferated. In 1910 there were two, by 1915, five, and by 1918, sixteen. These establishments included the Oklahoma Bottle and Glass Company in Blackwell, the Briscoe Glass Company in Bristow, Graham Glass Company in Checotah, Baker Brothers and Graham Glass Company in Okmulgee, and the Lopel Bottle Company in Poteau. The Muskogee Glass Manufacturing Company made gaslight globes. There were plants at Ponca City, Bartlesville, Avant, and Ada, as well. Among the resulting products were canning jars, water bottles, gaslight globes, lantern globes, and even glass caskets. Sand Springs in Tulsa County became one center for the industry. As Charles Page developed the town into an industrial center, he induced the owners of several glass factories to locate there. These included in 1913 the Kerr Glass Manufacturing Company, which moved to Oklahoma from Chicago in 1913–15. Kerr-Hubbard and Kelly Company made lamp chimneys, Sand Springs Glass Company also operated there, Alexander H. Kerr & Company made fruit jars, and the Sand Springs Water Bottle Company prospered. By 1955, however, only Kerr Glass Manufacturing and A. H. Kerr Company remained. Sapulpa in Creek County also benefited from the industry. Premium Glass was founded in 1912. In 1918 it was absorbed by Liberty Glass Company. By 1950 Liberty annually supplied a national and international market with one million glass milk bottles. Bartlett-Collins Glass Company, makers of household glassware, opened in 1915 and by midcentury employed five hundred. From 1918 Schram Glass Company made fruit jars, and Sunflower Glass Company made window glass. 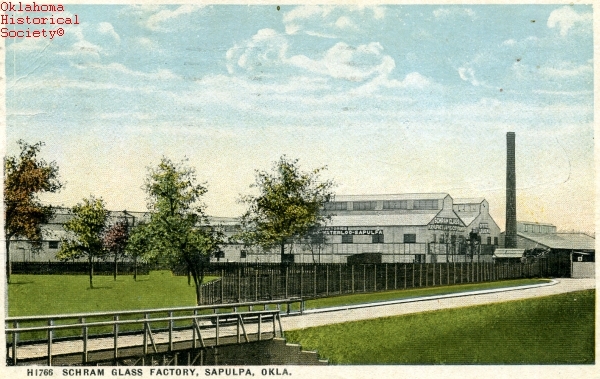 Glass production earned Sapulpa the designation of "The Crystal City of the Southwest." The glass industry has consistently contributed to the state's economy and to wage earners' incomes throughout the twentieth century. By 1929 glass manufacturing ranked ninth among the top ten industrial employers. In Okmulgee the Ball Brothers Glass Company established a plant in 1927, and American Window Glass Company established a factory in 1948, by 1950 employing five hundred. 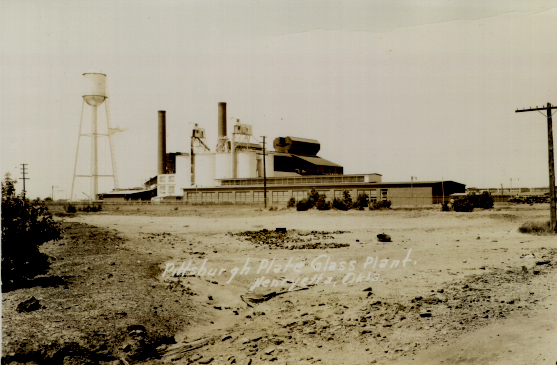 Pittsburgh Plate Glass (PPG) constructed a plant in Henryetta in 1929–30. The PPG factory, which made window glass, closed in 1974 but was purchased by Midland Glass Company in 1976 and refitted for making glass containers. Anchor Glass Company acquired Midland's plant in 1984 and into the twenty-first century continued to employ 350 workers. A surge of activity took place in the 1950s, and by 1960 the glass industry employed more workers than mining and lumbering combined. By 1950 Hazel-Atlas Glass Company of Blackwell employed two hundred in making beverage bottles and food jars. Container glass, in particular, was marketed both locally to food processors and to processing plants around the Southwest. Flat glass was shipped to manufacturers of automobile windows at factories in other states. Ford Motor Company opened a glass plant in Tulsa in 1974 to make tinted, insulated, and reflective architectural glass by the float method. After 2000 the one-million-square-foot factory was operated by Visteon Corporation. By 1980 eleven glass factories, the three major being in Sapulpa, Tulsa, and Muskogee, operated in Oklahoma and produced a diverse array of items, including glass containers, window panes, and ovenware. In the U.S. Census Bureau's 2001 survey of industry, glass was included in the category of nonmetallic mineral manufacturing and was that category's second largest, behind cement products. Twenty-seven glass-product manufacturing establishments, either making glass or making products by using premanufactured, purchased glass, employed 2,589 Oklahomans in 2001. Frank Buttram, The Glass Sands of Oklahoma, Oklahoma Geological Survey Bulletin 10 (Norman: Oklahoma Geological Survey, 1913). "Glass Manufacturing," Vertical File, Research Division, Oklahoma Historical Society, Oklahoma City. Clyde R. Hamm, "The Glass Industry in Oklahoma [booklet]," Oklahoma Employment Security Commission, Research and Planning Division, 1960. Gaston Litton, History of Oklahoma at the Golden Anniversary of Statehood, Vol. 2 (New York: Lewis Historical Publishing Co., Inc., 1957). John W. Morris, "Nonmetallic Resources," in Drill Bits, Picks, and Shovels: A History of Mineral Resources in Oklahoma, ed. John W. Morris (Oklahoma City: Oklahoma Historical Society, 1982). Oklahoma 2001, County Business Patterns (Washington, D.C.: U.S. Bureau of the Census, 2003). C. W. Shannon, Handbook on the Natural Resources of Oklahoma (Norman: Oklahoma Geological Survey, 1916). Dianna Everett, "Glass Manufacturing," The Encyclopedia of Oklahoma History and Culture, https://www.okhistory.org/publications/enc/entry.php?entry=GL002.